Universiti Selangor (UNISEL) merupakan sebuah Universiti swasta yang dimiliki sepenuhnya oleh Kerajaan Negeri Selangor. Ditubuhkan pada tahun 1999 sehingga kini menawarkan pelbagai program pengajian di kampus Shah Alam dan Bestari Jaya. Lokasinya yang strategik, secara tidak langsung memainkan peranan yang penting dalam menyumbang kepada pertumbuhan ekonomi dan pembangunan sosial negeri. 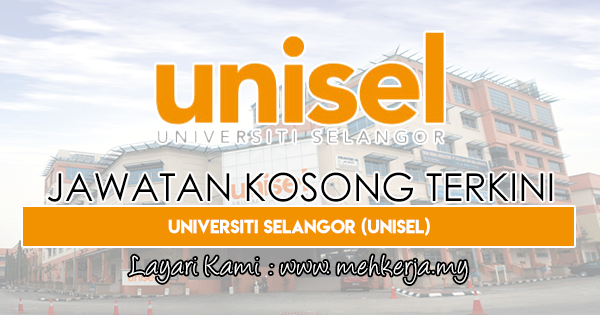 Universiti Selangor (UNISEL), formerly known as Universiti Industri Selangor was established on 23rd August 1999. We are currently operating at two campuses; the sprawling 1000-acre Main Campus in Bestari Jaya and the City Campus in Shah Alam. Our establishment is in line with the State Government's intention to make Selangor the leading regional education hub. Selangor plays an active role in the delivery of higher education programmes in order to enhance the development of human capital excellence. As one of the earliest private institutions of higher learning (IPTS) in Malaysia, UNISEL is unique as it is Malaysia's first state-owned university. Theories and hands-on practices in our learning environment have equipped many graduates with adequate skills to succeed in the professional world. We provide a broad range of programmes from technically-inclined fields such as engineering, information technology, health sciences and biotechnology to education, business and communication. Each one provides further opportunities for you to specialize and excel in the working world. Our education offers you an in-depth understanding of principles and practical knowledge in the field of your choosing. 0 Response to "Jawatan Kosong Terkini di Universiti Selangor (UNISEL) - 20 July 2018"